Discussion in 'GT350 and S550 Technical Forum' started by 8250RPM, Sep 2, 2016. I have a boat load of parts laying in boxes and I'm taking the holiday weekend off work to finally install all my parts. Ford performance aluminum IRS cradle bushings. Ford performance aluminum differential bushings. 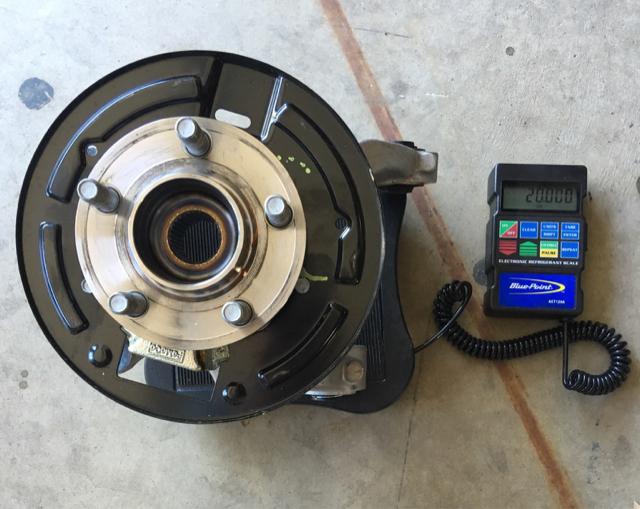 Ford performance toe arm bearings. Cortex lower control arm bearings. 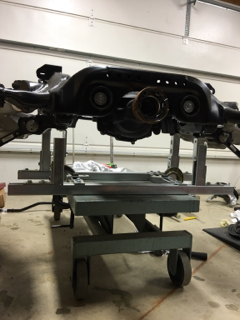 Powder coat all the suspension pieces semi gloss black. 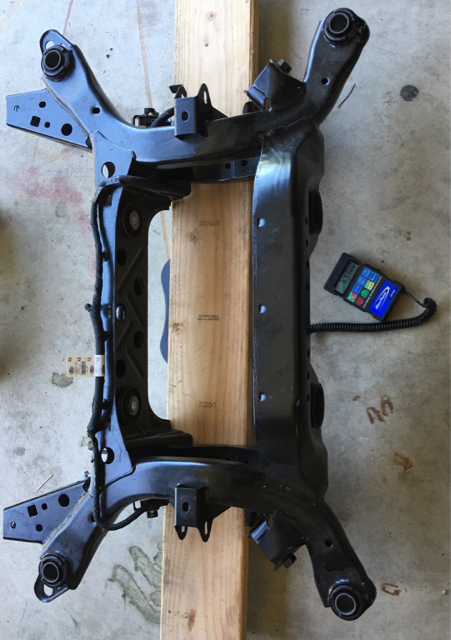 IRS cradle, brake dust shields, all misc brackets, camber links, BMR toe links, BMR vertical links, all 4 front control arms, sway bar bushing brackets. Powder coat red, R springs, R rear sway bar. 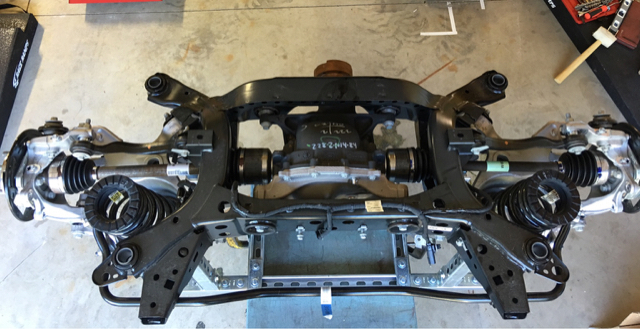 Paint semi gloss black, differential & axles. Today after work I removed the complete IRS from the car, it's pretty easy and straightforward. But what I noticed once it was removed from the car was the left axle shaft is A LOT bigger then the right axle shaft! 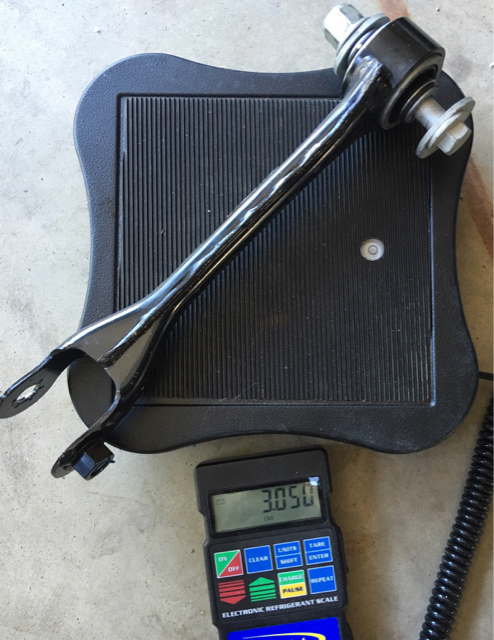 The left axle measures 1.300"
The right axle measures 1.112"
Even the left CV joint is noticeably larger! I hope I didn't get a screw up and the wrong right axle shaft. 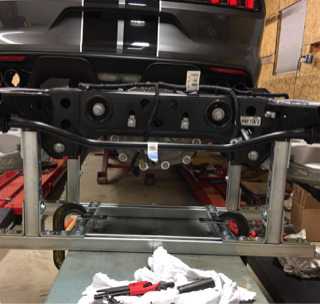 I know the splines are larger on the GT350 But it doesn't make sense why ford would put a smaller axle on the right side. Anyone notice this before? That sounds strange about the different axle sizes. Do you have a photo of them side by side? 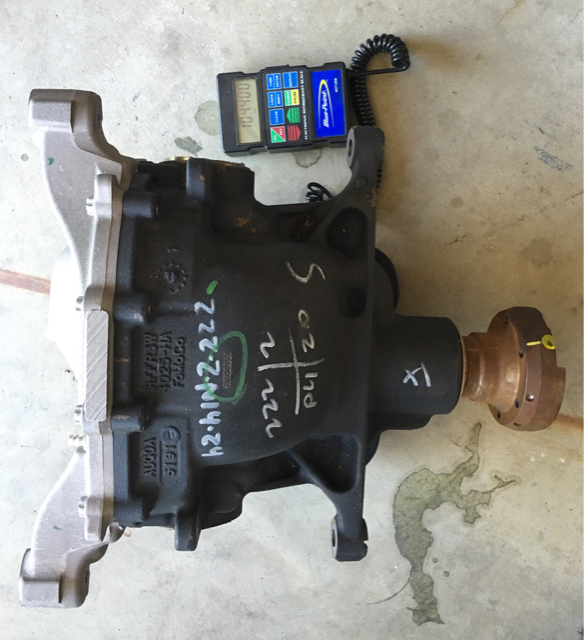 We (GT350) have the Eaton diff. My Owners Manual Supplement says it's got a Torsen diff, so do you mean you're swapping over to an Eaton diff? Is there a benefit to the Eaton over the Torsen? No sorry. I meant Torsen. I'm not swapping diffs. I'm replacing all the rubber bushings with ford performance aluminum bushings and cortex bearings. The board was zeroed (tare) from scale before cradle weight. They are different lengths too I guess. The right one looks longer. Seems like I remember the short axle on a 9" rear end was the one that always broke first. I think because it didn't have enough length to twist and absorb a shock load, axle diameter being equal. Does that sound right??? Any way, that's my only guess why the short one is beefier. If you weren't going to drag race this car as you are, I'm wondering if the aluminum center carrier from a Eco-boost would live in these cars at the road course. There is an auto-x racer in an S550 GT with BIG wheels and tires running one. The gear life might not be as good, but one of these days I might have to try that. The right axle is shorter and also smaller in diameter. I'm a mechanic by trade and honestly I never notice the 1/2 shafts ever being different in diameter to each other. I also mentioned the aluminum GT 5.0 automatic differential housing on the other forum for weight. But I'm keeping the cast iron diff. I'm not drag racing. I'm just eliminating all the rubber bushings. Well, you made me go out and measure mine. Pretty hard when it's on the ground, but mine are the same way. The right is thinner, same measurement range as yours though I couldn't be as exact as you. Thank you for confirming this. I appreciate that. 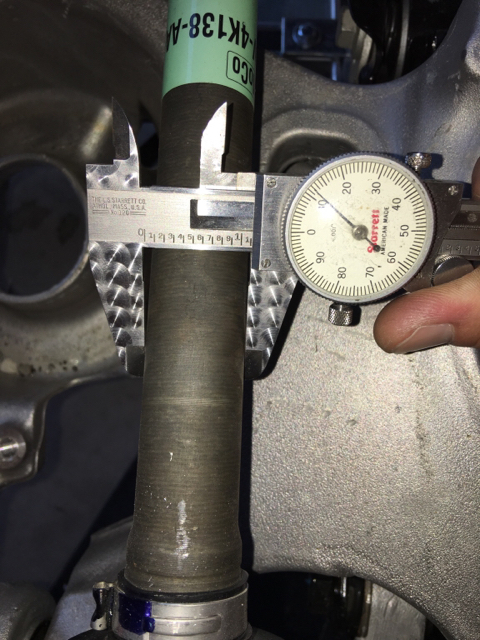 Just so you know if you install the FRPP aluminum diff bushings and Cradle bushings you will get lots of NVH. I have the BMR delrin cradle bushings in and the red steed diff. bushing in mine and it did little to the NVH. Very street able and does a great job of improving the movement of the IRS and Diff. 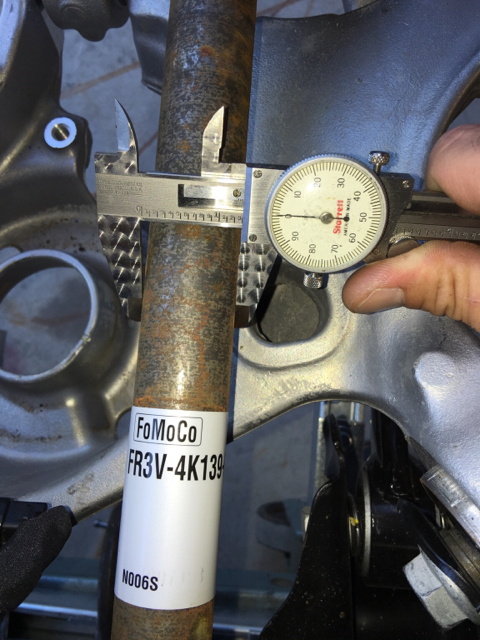 I don't know if they are supposed to be different sizes on the GT350, but on other vehicles, different length/diameter half-shafts are used to combat wheel hop (different natural frequencies). I was waiting to read the natural frequencies/wheel hop reply or I was going to post it. That's quite interesting. I never would have thought of using it to reduce wheel hop. I was at the GT350 Track Attack this week and Jim Owens of Ford Performance was attending the school. 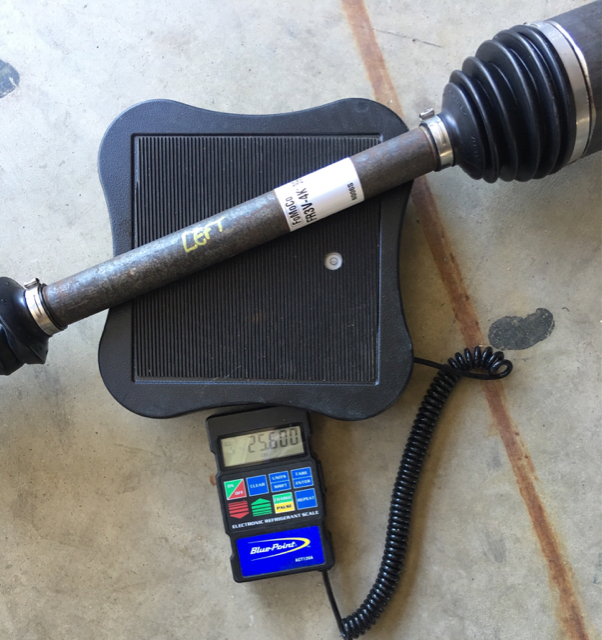 On my request, he texted the GT350 driveline engineer and he confirmed the axle diameters are that way to have two different natural frequencies to reduce wheel-hop. Ill be replacing the cradle/diff bushings. Did you use a sawzall to extract the OEM rubber bushings? I found a good video using the sawzall method. I see there is a removal tool available too.